0400 UTC June 20, 1999. 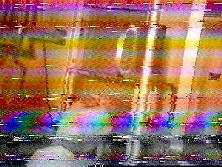 "This is CBC Radio One, broadcasting from the Hornby transmitter at 740 AM. 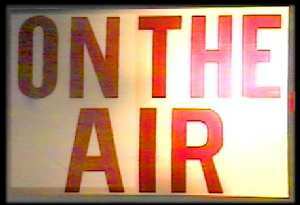 In the Toronto area we will now move to 99.1 FM with additional frequencies throughout Southern Ontario. This transmitter has served the community well since 1937 and has been at 740 AM since 1941. This is the end of an era in Canadian broadcasting history. Now, signing off from CBL, adieu." By the end of 1937, the new CBC radio network had built a 50,000-watt transmitters near Toronto (CBL). Interference from powerful US stations caused severe night time interference so at an international conference in Havana, in 1937, an agreement was reached for the redistribution of North American frequencies. When it was ratified, it gave Canada eleven clear channels ranging from high to medium power, and the shared use of forty-three lower-power channels for regional and local service. One of these clear channel frequencies was 740 kHz CBL. 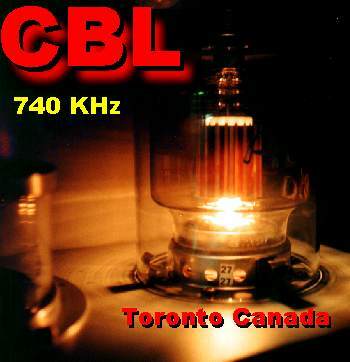 By now most CBL listeners will be aware that CBC has discontinuing many of its Radio One AM network stations moving to the FM band with the latest being CBL 740 at Hornby (near Toronto, Ontario, Canada). 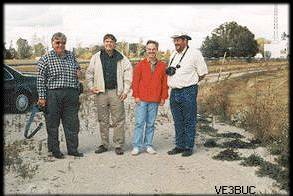 On Wednesday September the 9th, 1998 (left to right) webmasters Paul Cassel VE3SY for this site and Don Cassel VE3BUC for the Ontario DX Association along with Greg Hollinger VE3NXB and Gord Hayward VE3EOS of the K-W Amateur Radio Club paid a last visit to this powerful station. The power for the station starts with 6146's driving a pair of 4-400's (see above logo) which drive a pair of huge EIMAC 3CX35000 finals. 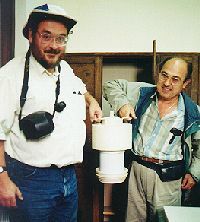 Gord and Roberto are shown here holding one of the spare 4CX35000 rebuilt EIMAC tubes. Modulation also starts with 6146's driving a pair of EIMAC 4CX2000 tubes which Screen modulate the pair of 3CX35000 finals. Our tour guide for the afternoon was Mr. Roberto Vissani C.E.T. Roberto provided an excellent technical overview of the current facility which hosts CBL 740kHz and CJBC on 860 kHz providing the CBC French language service. 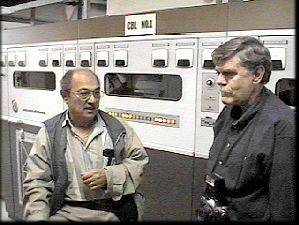 Roberto is pictured here left speaking with Don Cassel VE3BUC of the ODXA beside the large Continental CBL-2 50KW transmitter. 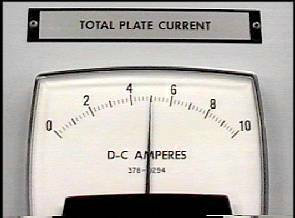 For those who may question the output of the station you can view the evidence on the meters below and calculate the DC Input power using the Ohms Law equation of . . . .
One of the mechanical wonders was the quite small ceramic insulator that supported the tower and guy wire tension that places ten's of thousands of tons on the base. The red arrow points to the single supporting insulator. Power to the tower lighting system is isolated from the tower by feeding the power through two huge toroid transformers marked A and B. 100,000 watts of RF is present at the base of the tower. 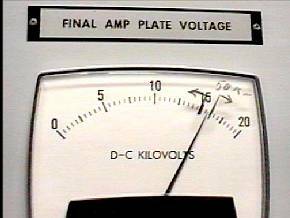 Add to that the 3dB gain of the 5/8 wave vertical and we have a relative Effective Radiated Power of 200,000 watts. 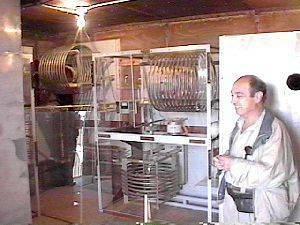 What is believed to be a world first was the combining of two 50 KW stations into a single 5/8 wave vertical tower (antenna). 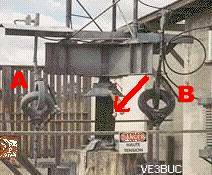 At first CBC engineers were planning on maintaining two sites however the added cost of two towers, two sets of engineers as well as site and maintenance costs made the challenge of combing the two transmitters a worthwhile venture. Roberto is pictured here during a brief stay in the combiner room. To maintain a safe level of exposure to this amount of RF energy, no one is allowed more than 15 minutes per day in this building. To demonstrate the amount of RF, Roberto placed a small screwdriver close to a metal object and produced this ARC. The audio of the broadcast station/s could be clearly heard modulating the ARC. Another hint that one was in an extreme filed of RF was my Video camera which I used to capture these images became unusable if I was any closer than 10 feet to the combiner and the camera would totally shut down when I moved to within 4 feet of the combiner. 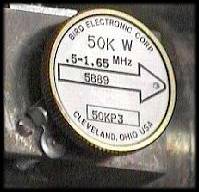 For those who love high power and have been unable to locate a "slug" for your BIRD Watt Meter, try keeping an eye out for one like this at the Dayton Fleamarket. I suspect however that one will have a long wait to spot one of this power rating. The 3 Inch Heliax feed lines from the CBL and CJBC transmitters both contained one of these elements. For a look at the ODXA images of the tour be sure to visit the Ontario DX Association web page . Be sure to check out the complete site as well. she will be missed . . . .